Super Bowl Sunday is almost national holiday so teachers, here are free printable Super Bowl lesson plans for students. TSL Books has free printable football lesson plans and Super Bowl math worksheets. Activities are based on football plays, player averages and statistics. How cool is that? Connect football and the Super Bowl with the classroom. Kids are learning while they enjoy the game. There are even some football and Super Bowl history lessons. Winter means means severe weather hazards of snow, ice and cold. And with spring comes increased concern for natural disasters like tornadoes, hurricanes, wildfires and earthquakes. Here are free printable weather science lesson plans on natural disasters, fire safety, emergency preparedness and other severe weather issues. I'll give you some freebie and then link to my Teachers Pay Teachers if you want to buy the rest of the packet. NOAA, the National Atmospheric and Oceanic Administration, has free printable severe weather science lesson plans. You can print free materials from the NWS (National Weather Service) and the Red Cross. You'll love the series of free printable severe weather science booklets from Owlie Skywarn. Owlie is the Red Cross owl who teaches children about different kinds of weather like thunder storms, tornadoes, lightning, floods, hurricanes and winter storms. Print activities and coloring pages of storms, lightning, hurricanes, fire safety and emergency preparedness. Check out severe weather printables, puzzles, word searches and weather experiments. Why not kick off the school year with a unit on animals? Special needs and preschool kids will love it and you'll teach valuable science lessons too. Here are free printable animal coloring pages to help. Visit Real Life at Home for free printable St. Francis lesson plans in a packet. Print games, coloring pages, activities and worksheets of saints. Learn connections to Pope Francis, who is a Franciscan and has taken his name from Francis of Assisi. Print a liturgical calendar of Catholic saints, including Saint Francis, free from Catholic playground. For free printable animal coloring pages, visit Coloring Book Fun. National Geographic Kids has realistic animal coloring pages from A-Z to print. This link opens on the animals A-I page but click the link at the bottom for coloring pages of animals from J-Z. For more detailed, educational animal coloring page printables, don't miss Edupics. There are over 1,600 animal coloring pages: some are even suitable for middle school and high school biology and science lessons! Hello Kids has hundreds of free printable animal coloring pages. Some are easier and geared for preschool or special needs students. Some are more challenging. Coloring.ws, from children's learning printables giant DL-TK has free printable coloring pages of animals from A-Z.Print every animal kingdom and phylum: insects, fish, birds, mammals, reptiles and amphibians. Teachers and homeschooling families, are you looking for a great unit to kick off the school year? Why not welcome kids back to school with an astronomy party to celebrate the recent solar eclipse? Earth science and astronomy are fascinating subjects to teach kids. Children can enjoy stargazing anywhere and everywhere and it costs nothing. Use free printable star charts, astronomy activities and constellation patterns to teach kids about space science. Here's a galaxy of star charts, constellation coloring pages astrology and horoscope zodiac signgs and night sky maps plus lesson plans on the eclipse, planets, meteor showers and more. SFA Observatory offers free printable star charts divided by region of the sky. Each constellation is labeled with Latin name and star shape. There's a handy guide to help stargazers orient themselves and their telescope for best viewing. Kids Astronomy has a free printable night sky map and star chart that can be customized by date and time. Kids Astronomy has entire interactive webpage for kids. Look for free printable earth science lessons, night sky activities, star charts and astronomy games. Homeschoolers and teachers, be sure to visit the educator resource page for free printable astronomy coloring pages, solar system vocabulary lessons and space science worksheets. 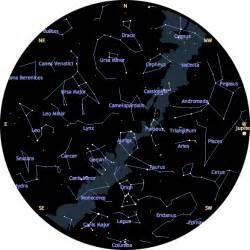 Sky Maps has free printable night sky maps based on latitude and hemisphere. Each month, users are sent a new edition of the sky maps reflecting the current month's constellations. Classroom, Jr.has printable constellation charts for Sagittarius, Virgo, Scorpio and Libra. Check this website for scads of free Earth Day printables. NASA Space Place is an interactive astronomy website for children from the National Aeronautics and Space Administration. Kids can learn to make their own paper-folded star finder. This will help locate major constellations for each month. There are also free printable constellation patterns for each month. Download and print to use as coloring pages, star patterns and star finders, too. Athropolis offers a collection of links to free kids' astronomy activities, simulation games, printable activities, star names, pronunciation guides and more. Children will love Star Child with a kids-club web design and easy astronomy activities. There are two sites--one for kids under 14 and one for those older than 14. Print a star chart for each student. Encourage them to trace the constellations on tracing paper. This will help them learn the star arrangements. They might use the charts as connect-the-stars activities. Fall means autumn harvest with lots of pumpkins and apples Apples are a common theme for preschool and elementary school students. Teachers and homeschoolers, are you teaching a fall apple unit? Here's a sweet treat for you: 166 pages of free printable apple themed worksheets and lesson plans. Northville Cider Mill in Northville, Michigan offers a free printable apple-themed activities booklet, There are printable coloring pages, worksheets, puzzles, games, word searches and crossword puzzles on apples. There are apple-themed cross-curricular science experiments, social studies connections, economics lessons, Michigan history activities, apple math problems and more. Each lesson has a printable student copy and teacher answer key. Use this book for all ages from preschool to grade 8. It can easily be used with special education students, too. Now scoot over to A to Z Teacher Stuff for more links to dozens of free printable apple lesson plans, crafts, mini booklets, games and worksheets. Most are geared to ages pre-K to grades 4. Kinderplans has cute free printable apple themed reading and phonics lessons for preschool and kindergarten. There are other printables based on apples, too. Print apple math lessons on counting, addition and subtraction. Print reading activities and games for emergent and reluctant readers. Special education will love the bright, cheery apple activities geared no-fail fun. The Rio 2016 Olympic Games kicks off on August 5 and runs through August 21 in Rio de Janeiro. This is the 33rd or XXXI Summer Olympics Parents, are you looking for ways to engage children in festivities of Rio 2016Olympic Games, or just keep them occupied so that you can enjoy the Summer Olympics? Then here are an "Olympian" assortment of free printable Summer Olympics and sports activities. Preschoolers and early elementary age kids will love these free printable Olympic Games coloring pages, worksheets, games, puzzles and crafts. Time for Kids has free printable Winter Olympics and Summer Olympics lesson plans and worksheets. Use these Rio 2016 Olympic Games and sports activities to teach math, probability, statistics, geography, social studies, sports activities, sports science and more. As always, Activity Village offers an array of mind-bendingly adorable free printable Winter and Summer Olympics and sports activitiesfor kids. Most downloads are free and feature hands-on, cut and paste crafts, Olympic rings crafts and recipes, board games, personal fitness scorecards, country flashcards, flags, bingo games and goodies. Games include models of Olympic medals (which can be personalized with child's name) and suggestions for customizing sports activities according to event. Check out Edupics for free printable coloring pages of sports represented at the winter and summer Olympic games. Then, explore the magical city of Rio de Janeiro in the beautiful country of Brazil with these free printable Brazil worksheets, lesson plans, coloring pages and crafts. Brazil hosted the FIFA World Cup in 2014 and now the Rio 2016 Olympic Games. Teach children all bout this South American country. Print flags of Brazil and all the countries represented at the Rio 2016 Olympic Games. Do you teach Sunday school, Vacation Bible School (VBS), CCD or Children's Liturgy of the Word? Perhaps you want something more than just coloring pages for your Religious Education or Christian school? Free printable Bible paper crafts can be very interactive. Children get to cut, assemble, paste, color and fold. All these VBS activities are hands-on and lots of fun. Here are free Christian printables and crafts that will suit your Bible lessons. You can find all sorts of religious Christian and Bible themes-- Old Testament, New Testament, holy days, angels, virtues, scripture verses and much more. These sites have free printable Bible games, board games, puzzles, paper dolls, puppets, finger puppets and craft activities galore! Making Friends has free printable Bible crafts by the dozen. Some Sunday school activities are for purchase, but those highlighted in pink are 'free printables'. Those highlighted in green are 'free pattern'. Making Friends is a website bursting with fun. Free Kids Crafts is another website overflowing with free Christian printables and Bible crafts. You can Christian crafts, Jewish activities, Bible and Torah crafts, VBS activities, lessons, angel craft projects, Sunday school lessons, plus so much more. Be sure to visit the homepage to see all the wonderful things available free! Use search for specific Bible crafts and try the site map to see the index of free Christian printables. Christian Preschool Printables should probably just be called Christian printables so that readers won't think that the free printable Bible activities are just for preschool age. You'll love the assortment of free printable Bible crafts for VBS activities, Sunday School, religious education and homeschool. You can find worksheets, calendars, lesson plans, board games, card games, file folder games, felt board activities, crafts and more. All Bible and Christian themes available. i recommend that you bookmark this site and subscribe to the email newsletter. Perhaps you may have some homemade crafts that you would like to share? A Kid's Heart is a charming website with dozens of educational and free Christian printables. These Bible crafts are great for Sunday School and VBS activities but also for homeschooling or Christian school in general. Subjects like math and reading are covered with hands-on activities based on Bible stories and Christian principles. There are games, finger puppets, habitat dioramas, puzzles, mazes and more. Start now with these VBS activities, gearing up for summer! As Americans gear up for 4th of July, Muslims are getting ready to celebrate what for them is a bigger holiday--Eid al Fitr. Also called Lesser Eid, this holiday ends the season of Ramadan. Here are social studies lessons on the Islamic holy season of Ramadan. Ramadan is the month-long religious fast celebrated by Muslims, during the month of Shawwal (sometime around June to August in the western calendar). In 2016, Ramadan began June 5 and ends on July 5. It begins with the first moon sighting which came a little early this year. Like the Christian season of Lent, Ramadan is a penitential season. Ramadan focuses on the Five Pillars of Islam. It ends with the celebration of Eid al Fitr. * Sha'hadah (Declaration of faith). This is a creed of faith that is repeated at worship. Catholic, Orthodox and some Protestant Christians repeat the Apostles Creed or the Nicene Creed. The gist of Sha'hadah is "la ilaha illa Llah," meaning "There is no god worthy of worship except God and Muhammad is His messenger." The word "ilaha" is similar to the Christian saying "god with a little g." It refers to anything people might worship or put faith in: money, possessions, technology or other gods. "Llah" is God with a capital G, the deity. Islamic Sha'hadah is similar to the first of the Biblical 10 commandments which many Christian faiths recite at services, "Thou shalt have no other gods before Me." Shema Yisrael, which is the cornerstone of Jewish prayer says, "Hear, O Israel; The Lord our God is one Lord." Jesus expanded on that in the gospel of St. Mark, calling this the greatest commandment. He added, "And thou shalt love the Lord thy God with all thy heart, and with all thy soul, and with all thy mind, and with all thy strength." * Salah (prayer). These are the five prayers recited daily by Muslims. Worship frames a Muslim's day and these prayers guide the worship. Muslims pray at dawn, noon, midafternoon, sunset and nightfall. All activities are covered in prayer. Muslims pray wherever they find themselves at the appointed time. These daily prayers are similar to Christian devotions. Catholics pray a similar Liturgy of the Hours, also called the Divine Office, including Matins, Lauds, Prime, Vespers and Compline. Many Christians pray in the morning, before meals and at bedtime. * Zakat (charity). In Christian faiths, almsgiving, tithing and works of charity are part of worship. Almsgiving is one of the three-pronged devotions of Lent. Muslims believe that all things belong to God and that helping others is part of spiritual growth. These acts are especially important during Ramadan. * Saum (fasting). Islamic tradition calls for abstinence from food, alcohol and sexual relations in marriage during Ramadan. It is part of the purifying process for Muslims. The Bible exhorts Christians to practice similar abstinence especially during penitential seasons. * Hajj (pilgrimage). Muslims are encouraged to travel to Makkah (Mecca) the holy city. Jewish people make spiritual journeys to the holy city of Jerusalem. In the early Christian church pilgrims would travel to shrines and places where miracles were said to occur. Places like Bethlehem, San Juan Compostela, Canterbury, Lourdes and Fatima were common pilgrimage sites. Ramadan is a season of prayer, almsgiving and fasting like Advent and Lent. Like these two Christian seasons, Ramadan is followed with celebration. Christmas follows Advent. Easter follows Lent. Eid al Fitr is the celebratory feast that concludes Ramadan. Eid al Fitr begins on July 5 in the eastern world and a day later in North America. Explain in social studies lessons that, like other religious holidays, special foods are prepared and new clothes are purchased for Eid al Fitr. People exchange gifts and sppecial games, like Mheibes mark the holiday. Eid al Fitr is a festive time. To wish someone a happy holiday, say "Ramadan Mubarek." The summer patriotic U.S. holidays, beginning with Memorial Day, turn attention to American government and historyt. America was founded on a democratic government system. Here are free printable American government lessons on democracy and core democratic values for teachers and students. PBS Kids free printable American government lessons teach that democracy is a Greek word meaning 'government by the people' ('dem' people + 'cracy'). Check that link for more free printable Greek words and roots. The people of Ancient Greece were the first to establish the idea of common people ruling their own country. In Greek democracy, all citizens had a right to participate in the process of choosing who from amongst their ranks would represent them. Typically nations were ruled by other forms of "-cracy" or "-archy." A monarchy refers to a country ruled by one supreme head, such as a king. "Oligarchy" refers to rule by a few elite people. In these forms of government, people who were ruled had no say about who their ruler would be. Leaders came to power by inheritance of a crown or by forced military take-over. These rulers had absolute power. They made the laws that the common man must obey. Typically the rules they made did not include themselves. Never before the Greeks had a nation been ruled by a collective of people who voted to choose representatives. Here are free printable American government lessons on Greek democracy. Never before had a nation's people been given a voice over who should make the laws or what those laws would be. Never before had the rulers of a country had to obey the laws they made. The Greek experiment with democracy, or rule by the people worked well. Here are free printable Ancient Greece and core democratic values lesson plans to use for American government lessons. Along with a system of democracy and core democratic values, the people of Ancient Greece taught gave the world philosophy, music, art, literacy, technology, medicine, science and language. Here is music of Ancient Greece for American government lessons. Here are free printable lesson plans on the medicine of Ancient Greece to use for American government lessons. Here are free printable Ancient Greece lesson plans on all those subjects. When the founding fathers and mothers in America set out to establish a government, they looked to the Greek form of democracy as a model. Early Americans had experienced life under the monarchy of King George III and his predecessors. They had lived in a colony ruled by another nation across the sea. The American colonists knew about monarchies and oligarchies. To them, core democratic values in rule 'by the people of the people and for the people' looked very attractive. In the First and Second Continental Congress they drafted what a federal constitution and Bill of Rights that would become a model of democracy outlined core democratic values for other nations as theirs was modeled after the Greeks.